Relatives sit near the Raspadskaya mine in the Kemerovo region of southwestern Siberia on Sunday. (CNN) -- The death toll from explosions at a Russian mine climbed to 30 on Monday as rescue efforts resumed in western Siberia, the nation's Emergency Situations Ministry said. A search of the mine was suspended on Sunday because of limited visibility, according to Elena Chernova, a spokeswoman for the ministry. Three hundred and fifty nine people were working in the mine, near the western Siberian town of Mezhdurechensk, when a gas explosion occurred around 8:55 p.m. Saturday (12:55 p.m. ET). More than 50 rescue workers descended into the mine to recover the victims when a second gas explosion occurred about four-and-a-half hours later, officials said. At least 18 of the rescue workers died in the second blast, while others were trapped. Earlier Sunday, local officials blamed the accident on a partial rock collapse inside the mine. 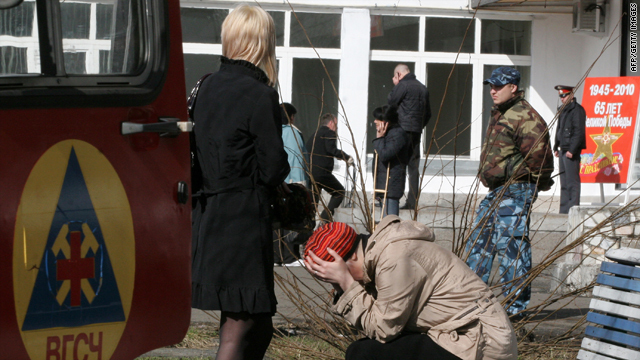 Russian President Dmitry Medvedev pledged federal aid in responding to the disaster. Mezhdurechensk is more than 2,300 miles east of Moscow.